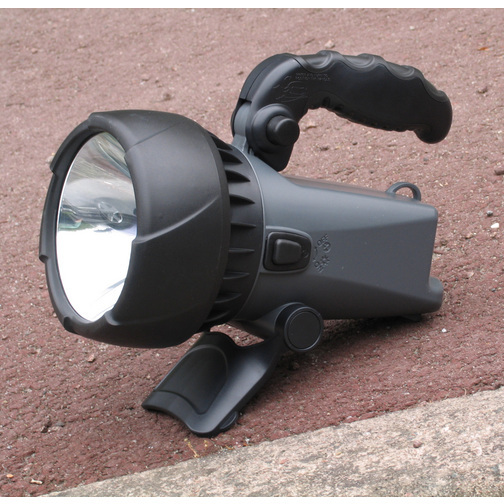 A weatherproof LED 1.2 Mega candle power rechargeable torch complete with mains 230v and car/boat 12v chargers. The weatherproof rechargeable LED torch features a powerful LED bulb, an adjustable stand, a rotatable handle and comes complete with a mains 230v and a car/boat 12v charger offering maximum flexibility. The torch features an energy efficient super bright 1 Watt LED which equates to 1.2 Mega candle power. The LED provides a bright but cool beam making it safe to touch the torch and lens during operation. The LED is not like normal bulbs so there should be no need to replace it and it is more efficient meaning the light will lasts for approximately 5 hours on a full charge. 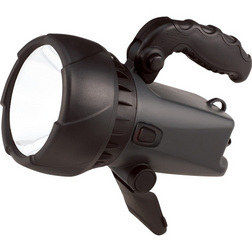 The Night-SearchEye Rechargeable LED Torch features an adjustable stand which allows you to set the angle or the torch for hands free operation, useful when loading or unloading the boat in the dark. In addition the handle on top of the torch can be angled in to a pistol position for long range accuracy with the lower position for short range searching. The LED torch is ideal as a replacement or temporary searchlight on your boat, for taking camping or fishing or as an emergency light in your car. It can be charged up at home with it's mains wall charger or on the move via a cigarette lighter style 12v plug.